I posted last week about getting my invite to the New Google Maps and there are a bazillion (yes, that’s a real number – and I counted up to it and then gave up) changes that will impact your positioning on these maps. And that will impact new customers finding you. #1 No left column of the top ranked listings. It’s all one big map with a floating search bar. Instead of a local results column, you now see highlights and names of Places right on the map itself. There is no 1, 2, 3 or A, B, C ranking. So above you see the listings for several Dentists. No ranking order on the map. The one selected shows in the new “Info Card”. As mentioned, no direct link to the G+ Local page except via the reviews link. #3 Ranking results are VERY different than Google search ranking order. When you do a keyword search, as I explained, there is no ranking order on the map. Although only the listings Google thinks are most important will show with a label. The rest are unlabeled dots. HOWEVER here’s the biggie. When you click that link to view top results, the ranking order is VERY different than the ranking order on the 1st page of Google search. So the algo is either different OR things just aren’t jiving in Maps BETA. But here is an even bigger issue! You know how the Places search is gone now and the “more results near” link is gone now? So you can’t get beyond page 1 of the results in Google search. Places search is what the rank tracking programs used to calculate rank. So if someone was on page 2 they may have ranked #23. Well when that went away, the tracking programs (I believe both Bright and Scout) switched to using the ranking order on the left column of maps, because that’s all that was left. Now that left column is gone. SOOOO the only place to see ranking order is “top results”. But again that ranking order is TOTALLY different than page 1 search. #4 Everyone’s map will be different. This will possibly be the biggest issue of all. You can’t tell a client they rank #3 because a consumer’s map will be personalized for them. And your client may see something totally different than what you see. Here is quote from a post I did over the weekend. The map is not a static map. Your map will not look like my map. And the map for “Dallas Dentist” I look at when trying to see how my client ranks could be totally different than what my client sees. And what that potential new patient sees doing a 1st time search could be different than his results or mine. This new map is built at search time, based on not only traditional ranking factors (like popularity, proximity and # of reviews) but also personal preferences, past browsing history and anything else Google decides to throw into the mix. So tracking results is going to get very interesting. The new Google Maps also learns from you, changes & grows with you! I think his competitors MAY appear more prominent to him than they really are (or would be to a patient, doing a 1st time search). Here is a Google Hangout Ryan AKA Optimize Prime did about the new Google Maps yesterday where I was able to ask some questions and have him show some examples that bring the points above to light. 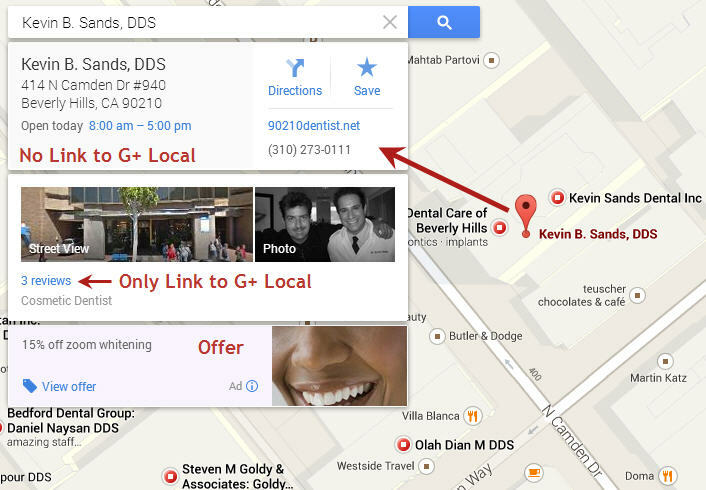 You’ll discover lots of changes in this video that will impact Local Search. Below are 2 posts from here at the forum over the weekend with lots of great discussion about the changes and how they could affect our world. I’ll be testing this New Maps preview as I have time. I’m sure I’ll be sharing more posts about all these changes and I hope to do some ranking analysis to try to determine how the algorithm has changed in the new top results order.